Spanish Sage may look like Dwarf Garden Sage but the flavor is totally different. Spanish Sage is missing most of the camphor flavor found in normal Slavia officinalis. We like it better for making tea. However, you can use Spanish Sage in any recipe calling for Garden Sage. 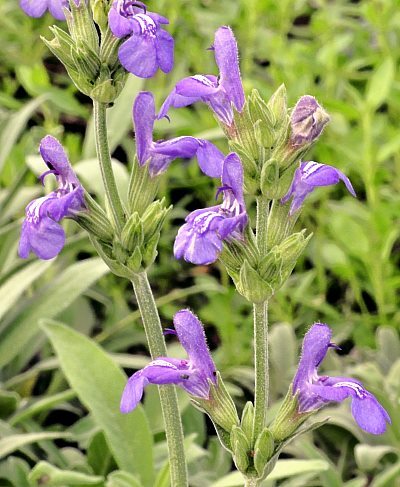 Spanish Sage would make a tasty addition to our Kitchen Herb Garden Six Pack or our Gourmet Herb Garden Six Pack. This plant is sometimes available in plug trays. These trays hold 128 of all the same plant. They are a great low cost way to fill a lot of space. Each cell is 3/4 of inch by an inch. Check here to see if Spanish Sage Plug Trays are available.